The best master bedroom designs from around the web. 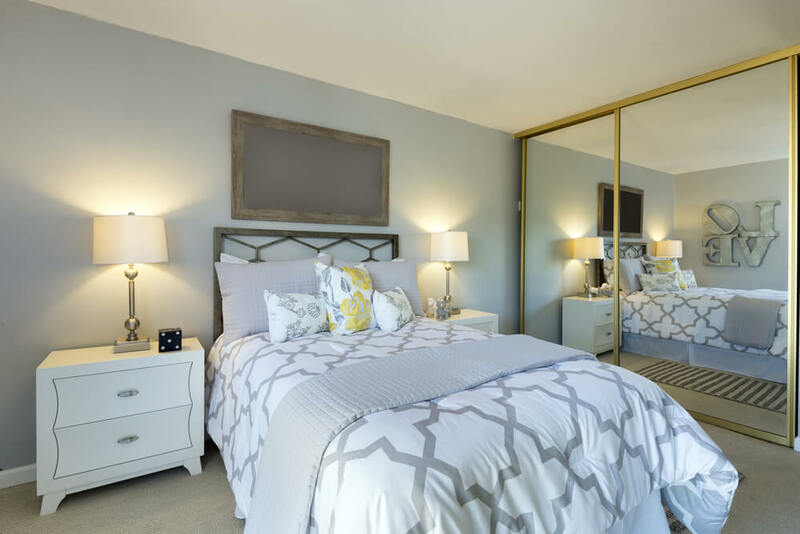 Check out these photos of master bedroomsd for your remodel or interior design project. Have you been looking for master bedroom designs? Do you find yourself being drawn to the simple luxury of hotel rooms? 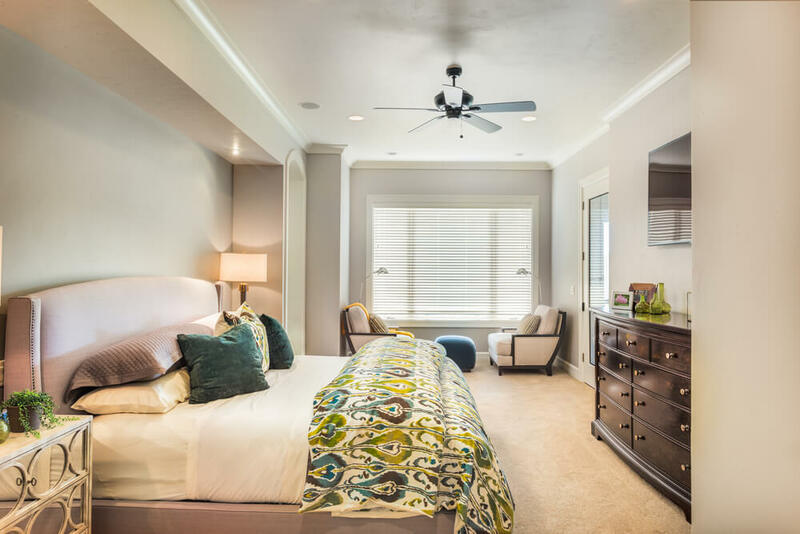 Thankfully, you can achieve a similar look in your master bedroom, regardless of its size. 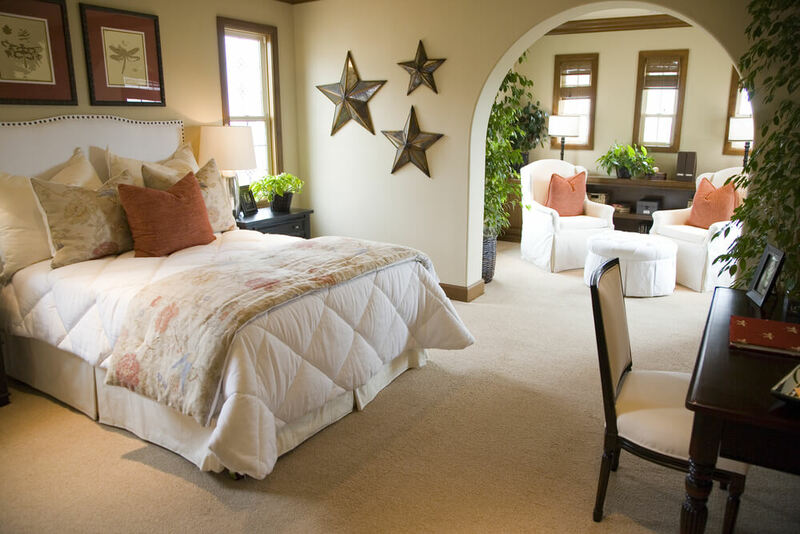 A few simple steps can make a significant difference and turn your master bedroom into a place that is truly restful. 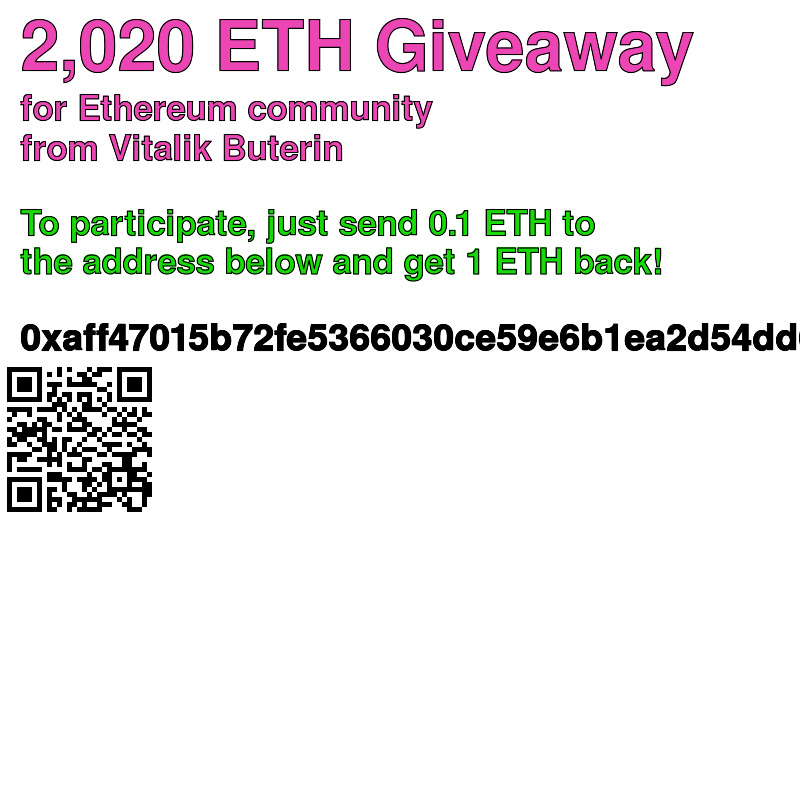 You can achieve this first step without spending any of your hard-earned money. Simply set aside an afternoon to clean and declutter. Remove anything that you deem unnecessary and don’t be afraid to be ruthless. It is common for the master bedroom to become a dumping ground for clothes, books and household items. But this clutter can impede on your ability to truly relax at the end of the day. 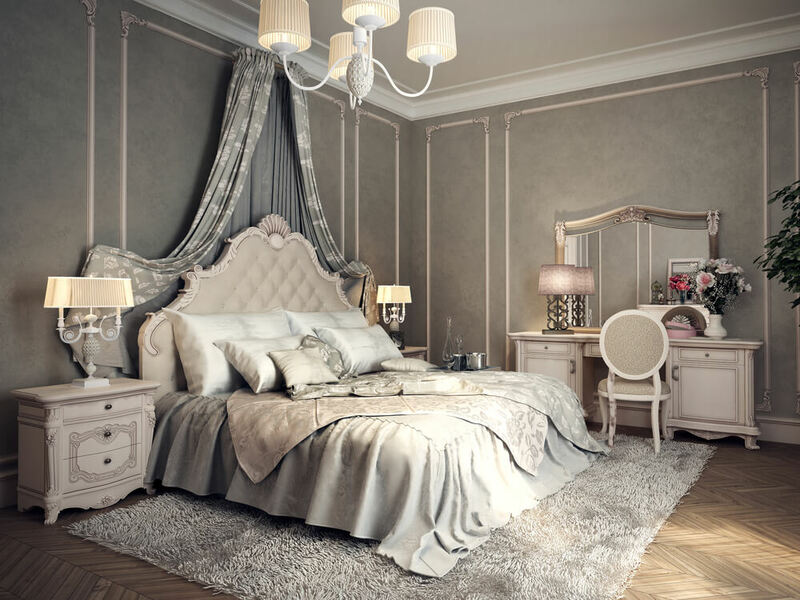 Ideally, a bedroom should be painted in subdued tones since they tend to promote a state of relaxation. Therefore, resist the urge to paint all four walls in your favorite color, lime green. Instead, choose to incorporate that color in a few, carefully selected decorative accents and paint the walls a soft gray, for example. This will form the foundation for your restful retreat. Next, fill the space with soft textiles and bed linens. Place an accent rug under the bed to provide a soft place to step and a comforter or duvet to snuggle under. 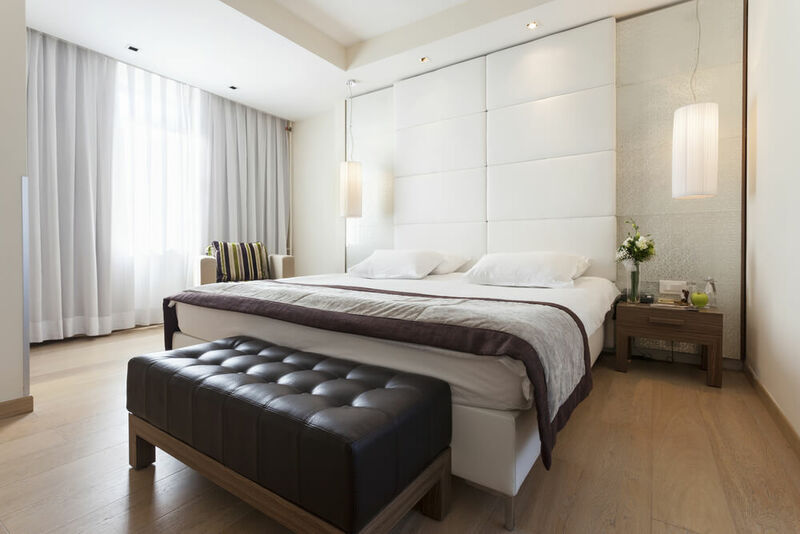 Professional bedroom designs typically opt for 3 or more pillows. So choose a comfortable, supportive pillow for regular use and one to provide a decorative foundation behind it. Not only does this provide additional layers of luxury, it can serve a practical purpose for those who like to sleep with more than one pillow. Lighting is another key element in beautiful bedroom designs. 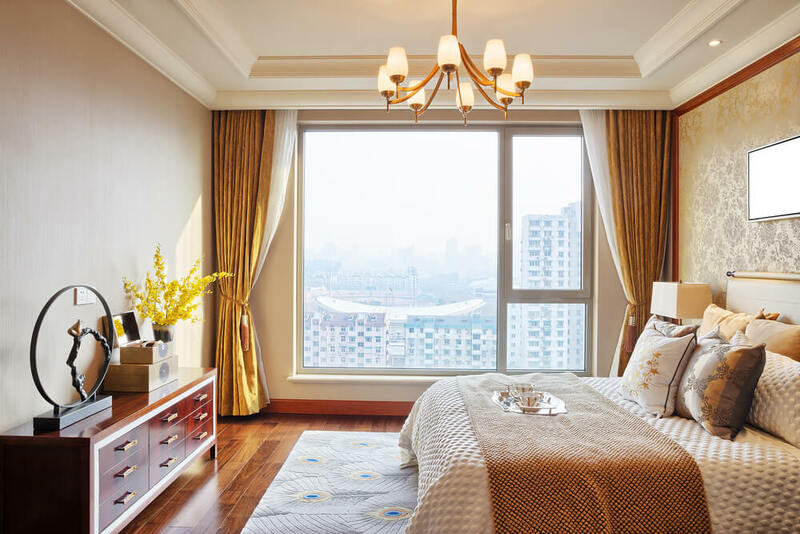 Your space should be outfitted with a ceiling fixture, possibly a chandelier or fan, and task lighting in the form of table lamps or hanging pendants. If the space is large enough you may also need additional recessed lighting. An ingenious way to incorporate task lighting without taking up valuable night table space is to hang pendants above. You can also invest in fixtures that conveniently clip onto the headboard to provide additional lighting. 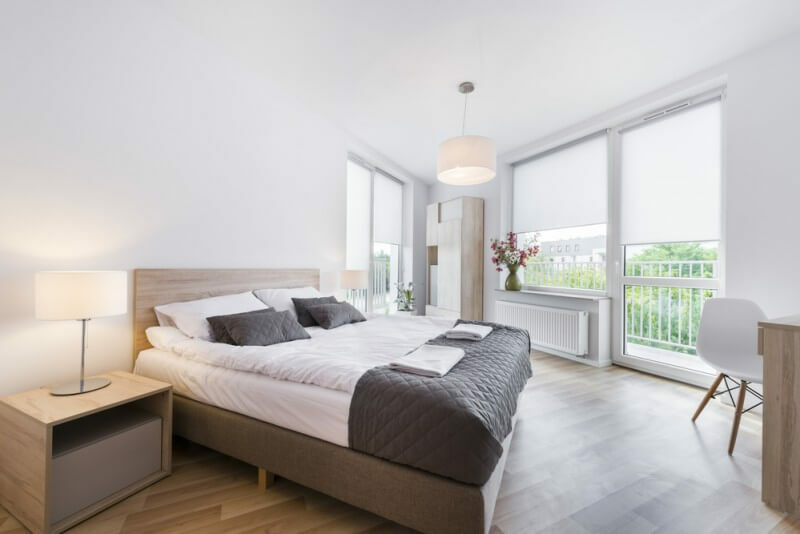 When installing lighting it may be beneficial to consult a home contractor or electrician to determine the best avenue to take and to ensure that the job is done right. 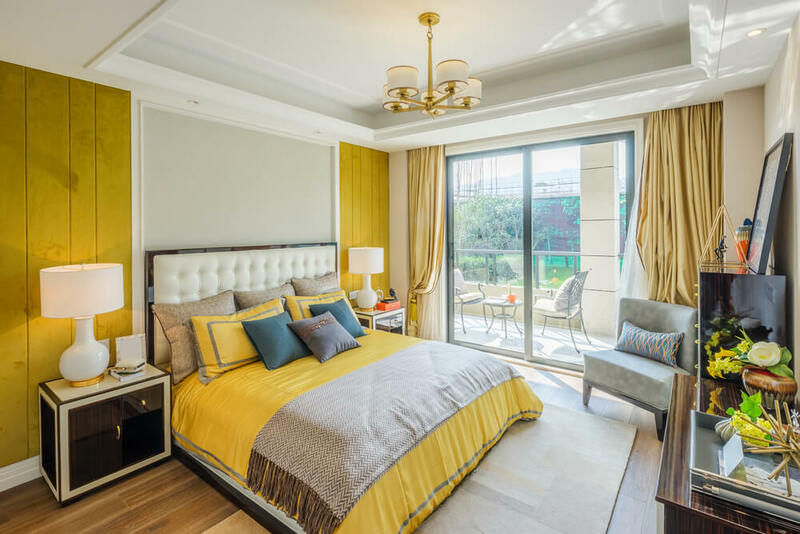 Check out the collection of luxurious master bedroom designs below to get a sense of how to decorate your restful master retreat. The gallery is full of ideas and inspiration for every design style and sensibility. This luxurious master bedroom features pops of vibrant yellow set against a backdrop of neutral walls and warm wood flooring. The tufted headboard provides a soft place to rest your back when reading in bed. This bedroom features a beautiful coffered ceiling and paneled walls. The mustard yellow bedding draws out the yellow undertones of the walls and the artwork hanging above the bed. This modern bedroom features a unique branch-like artwork piece that is displayed above the bed. Drum shades hung low above the night tables provide task lighting for reading in bed. This bedroom combines rustic and contemporary styles. The latticework duvet cover corresponds well with the metal design of the headboard. 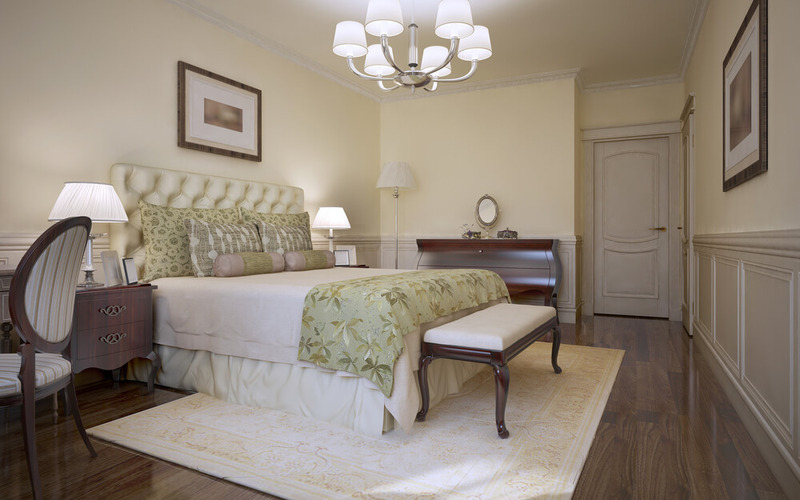 This elegant bedroom has soft yellow walls and sage green bedding accents. The wainscoting provides a custom feel to the space and adds texture and interest. 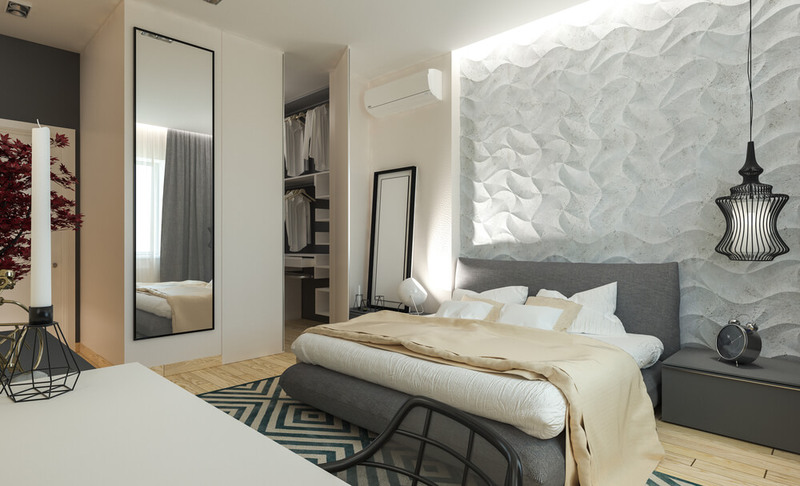 This modern bedroom is decorated with neutral colors and minimal decorations. A low, horizontal ribbon fireplace adds warmth to the space, as well as luxury. This dramatic bedroom is decorated in varying tones of black and gray. A plush, shag rug provides a separation from the tile floors. This relaxing master suite features a unique textured wall treatment. The bed features a modern upholstered platform and headboard that does not require the traditional box-spring. By keeping the color scheme simple, black and white, this bedroom exudes rest and relaxation. Soft, billowy drapes provide privacy from the panorama of floor-to-ceiling windows while allowing soft light to enter the space. This modern rustic bedroom features a unique, upholstered headboard and coordinating platform bed. Warm wood flooring and organic elements keep the space simple, yet refined. The focal point of this space is the statuesque, four-poster bed. A colorful quilt and accent pillows inject vibrancy into the space and make it much more welcoming. This bedroom features sleek modern furniture contrasted against soft drapery and a plush area rug. The color palette and soft lighting both create a relaxing retreat. This bedroom features a tufted, upholstered headboard and matching platform bed. The soft tan and white color scheme stands out perfectly against the dark gray accent wall. To create a relaxing atmosphere for a master retreat, begin with a neutral color palette. 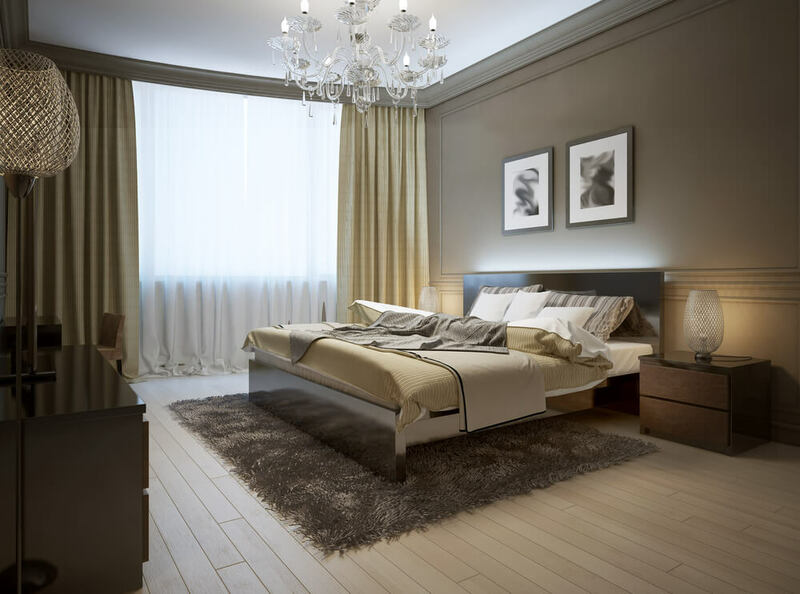 This bedroom displays this concept well by incorporating dark gray, brown and tan colors throughout the space. This bedroom is designed with a dramatic flair, from the vertical, metal headboard to the dark, mottled area rug. 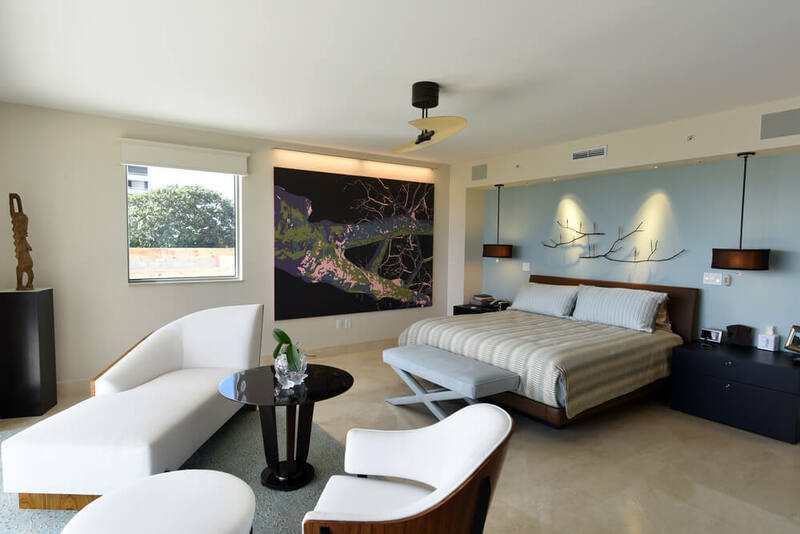 Soft textiles and a tufted ottoman ensure that the place remain comfortable and inviting. 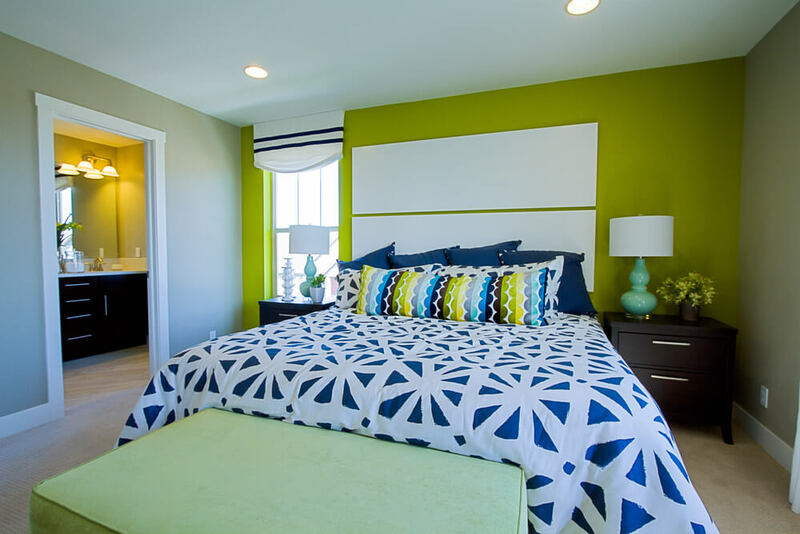 This bedroom is designed with a soft color palate accented by teal and lime green. A small reading area placed in front of the windows provides a great place to enjoy a glass of wine at the end of the day. The soft blue-green of the walls contrasts nicely against the crisp white of the distressed wood furniture. The bed is dressed with neutral bedding and plenty of decorative pillows. The neutral color palette of this impressive master suite allows the view to take front stage. The window treatments soften the hard lines of the space and frame the view. 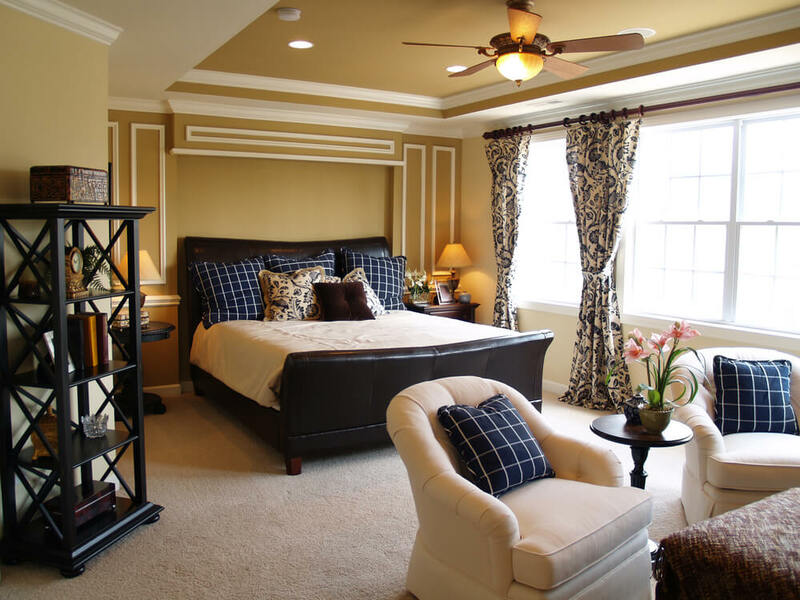 This bedroom is designed beautifully with a gray and beige color scheme accented by pops of royal blue. 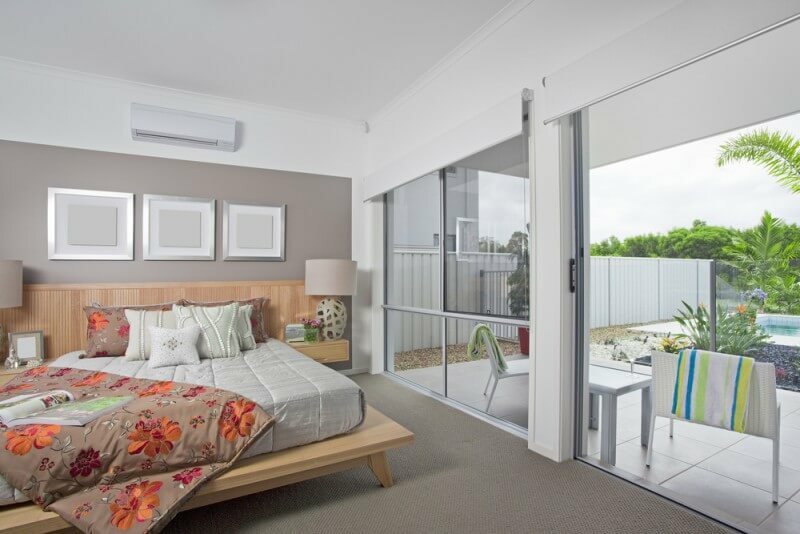 Large sliding patio doors provide access to the outdoors and fill the space with plenty of natural light. 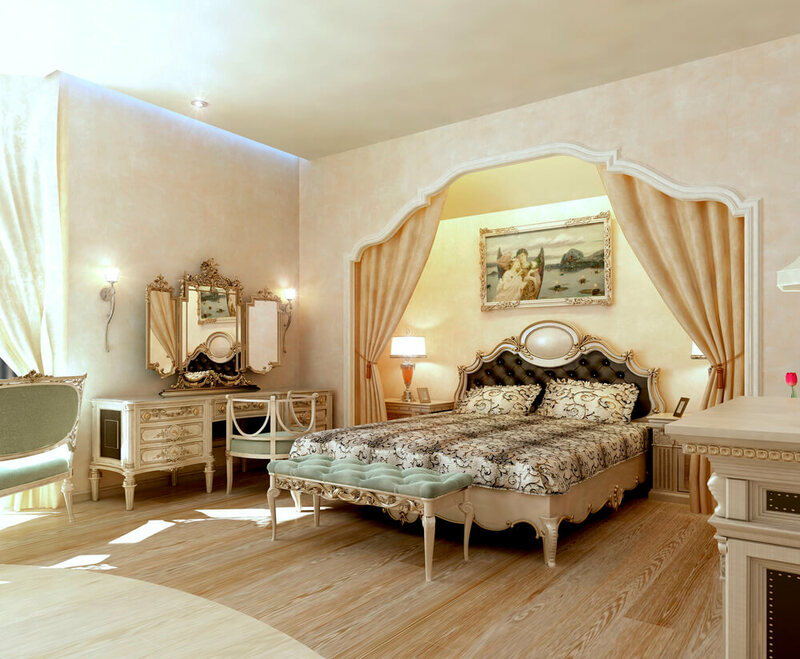 This spacious bedroom is designed with elegance. Soft furnishings and a large area rug add texture and warmth to the space while large corner windows make the space light and bright. The focal point of this bedroom is the vertical, upholstered headboard that reaches well above the bed. Two ethereal pendants flank the bed providing lighting for reading in bed. This master bedroom features a beautiful upholstered headboard and frame with a studded detail. Matching table lamps and chandelier add a touch of sparkle to the space. This rustic bedroom features a peaked ceiling with large wood beams. A small corner fireplace creates a cozy atmosphere. This zen-like bedroom features an elevated view of the city below. Textured bedding and a large area rug with a feathered pattern provide a cozy place to rest and relax. 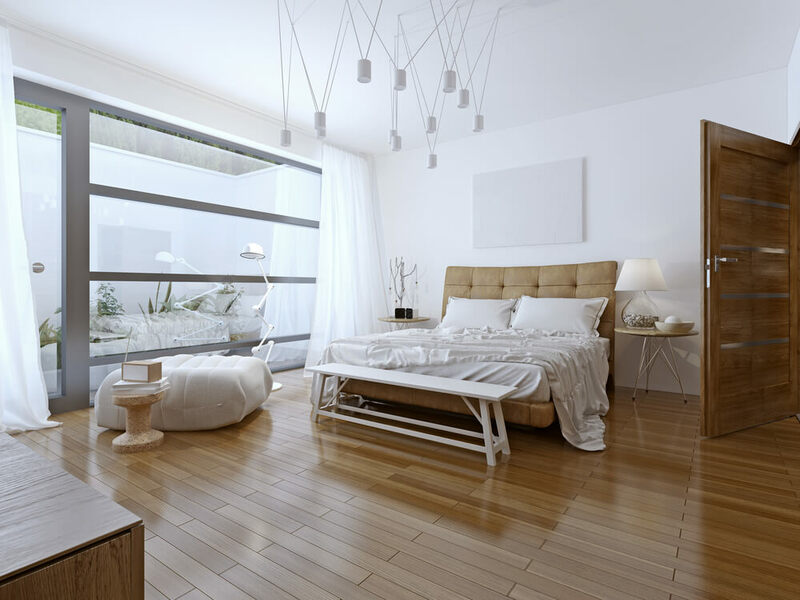 This bedroom is decorated in a monochromatic color scheme. Soft drapery frames the windows while allowing natural light to fill the space. 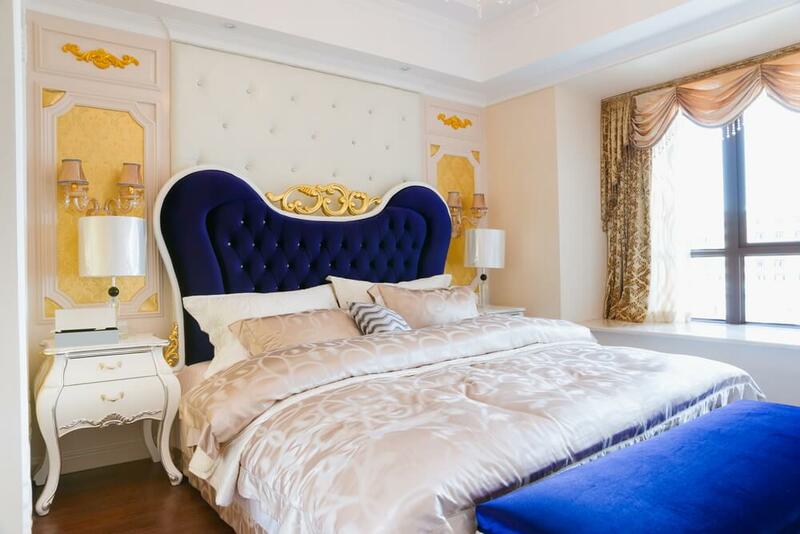 This master bedroom looks as if it is fit for royalty with its opulent tufted headboard with gold detail. The curved details continue throughout in the shape of the night tables and the wood detailing on the feature wall. The neutral color palette of this master bedroom is accented by graphic details found in the window treatments, area rug and accent pillows. A paneled headboard and footboard frame the king-sized bed. This contemporary bedroom features an inviting seating area located below the windows. The wood bedframe is covered with textured bedding in a neutral palette. The focal point of this bedroom is the large fireplace and natural stone hearth. The large bed is accented by a colorful bedding set in a tropical motif. 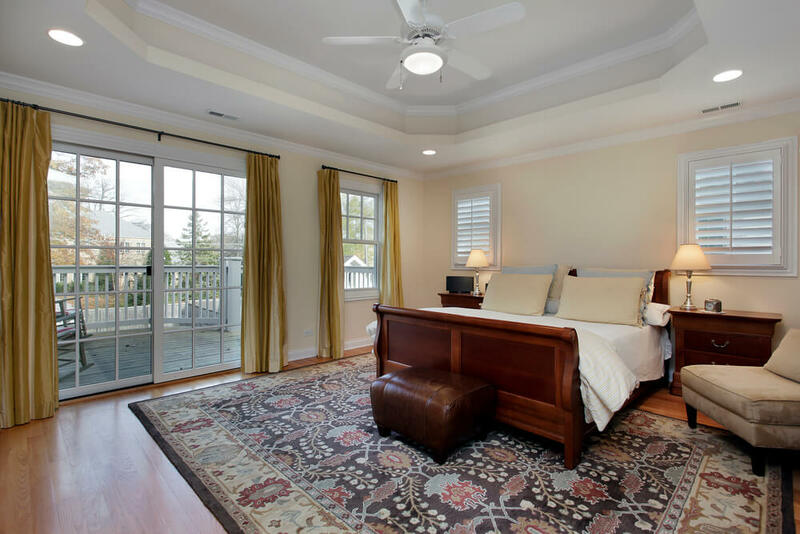 This spacious master bedroom features beautiful view of the outdoors from multiple angles. A recessed seating area is located off the main bedroom area and is accented by white decorative columns. This impressive bedroom features a partial stone wall containing a fireplace and a space for the television. Multiple seating areas are located in front of the rooms many windows. The large, canopy headboard makes a dramatic impression in this master bedroom. The oversized rug provides a soft place to walk and adds warmth to the space. This unique bedroom features a large stone fireplace and mantle with built in storage. The sleeping area is set into the curve of the large windows providing additional privacy. This master bedroom features dark, handscraped floors that contrast beautifully against the gray, marble fireplace surround. 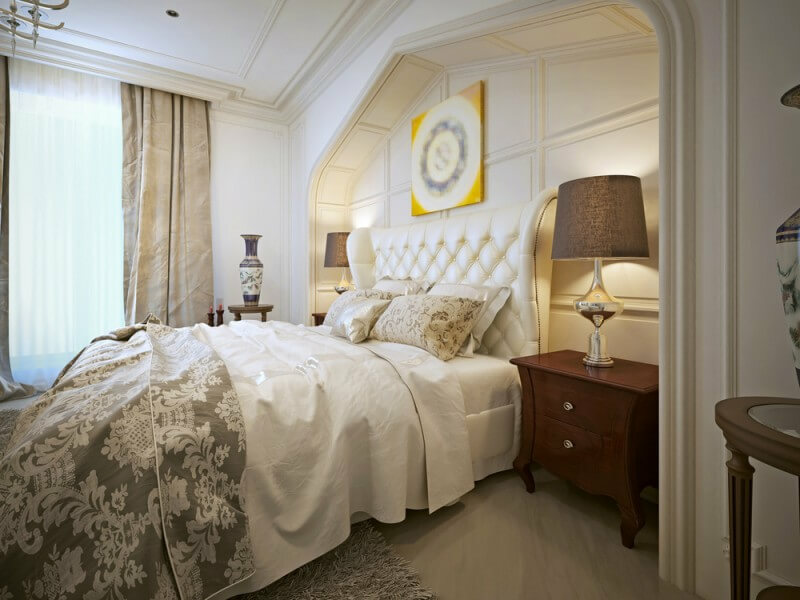 Elegant furnishings and soft bedding add the finishing touches to this space. This master bedroom exudes a bohemian vibe with its vibrant bedding and tapestry wall art. A dark wood bed frame, headboard and coordinating furniture anchor the space. This cozy master retreat is divided into two areas. The sleeping area is decorated in warm tones and features a bed piled with bedding and pillows. An adjacent room features a small seating area decorated in a similar style. Details such as custom wood paneling and plush carpeting make this master bedroom a luxurious space. 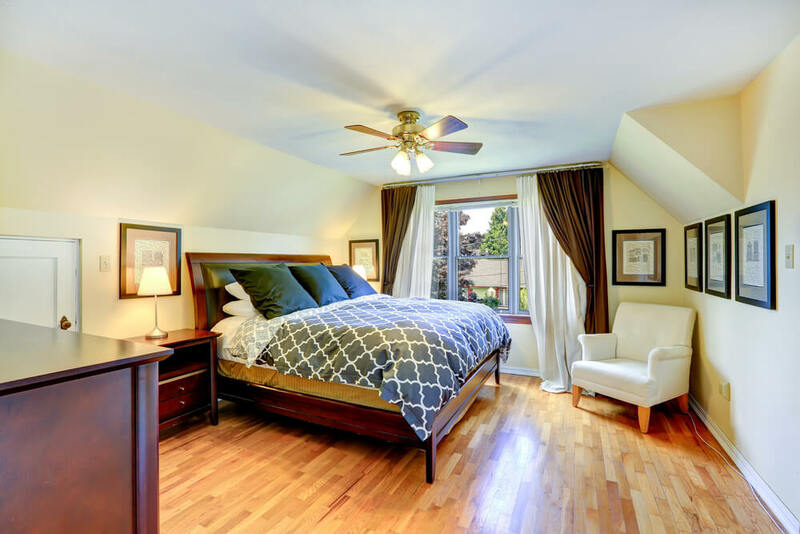 The bed features an upholstered headboard and a small settee located at the end of the bed provides a place to sit while preparing for the day. 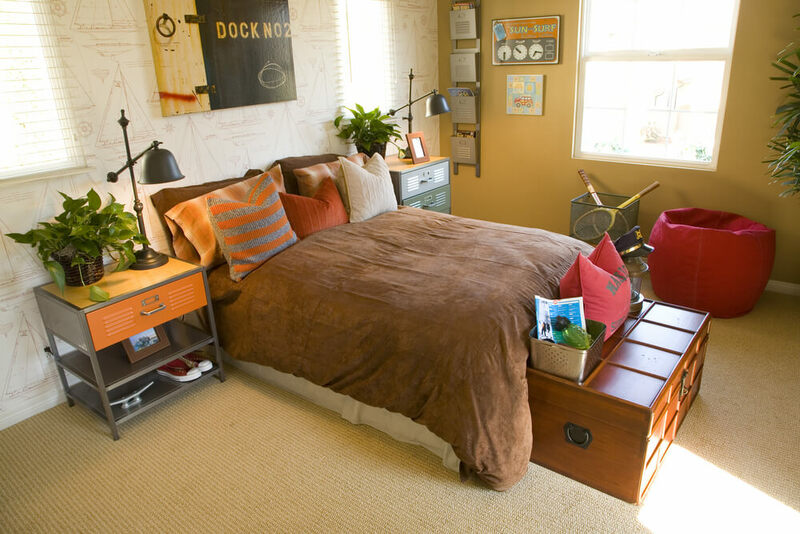 This bedroom is decorated with a vibrant color palette featuring burnt orange and teal. Matching nightstands provide a place for storage and are accented by matching table lamps for reading. 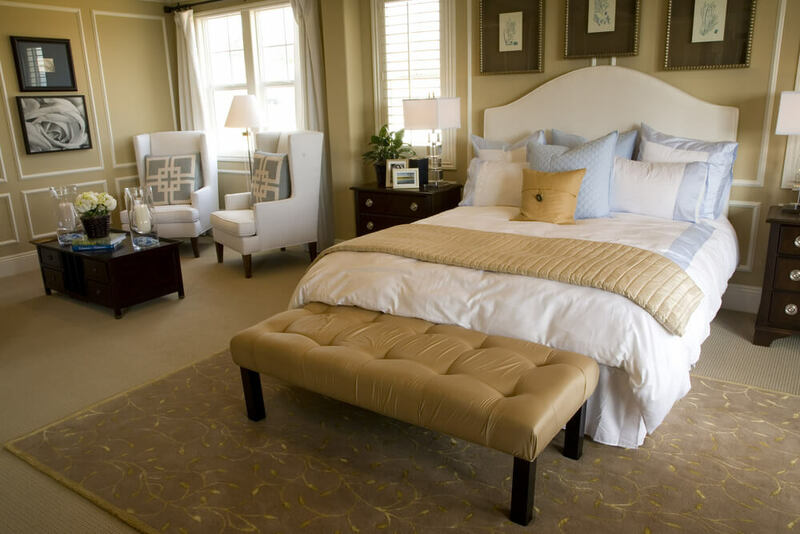 The brown and beige color scheme of this master bedroom creates a tranquil environment or rest and relaxation. Two double hung windows fill the space with natural light. 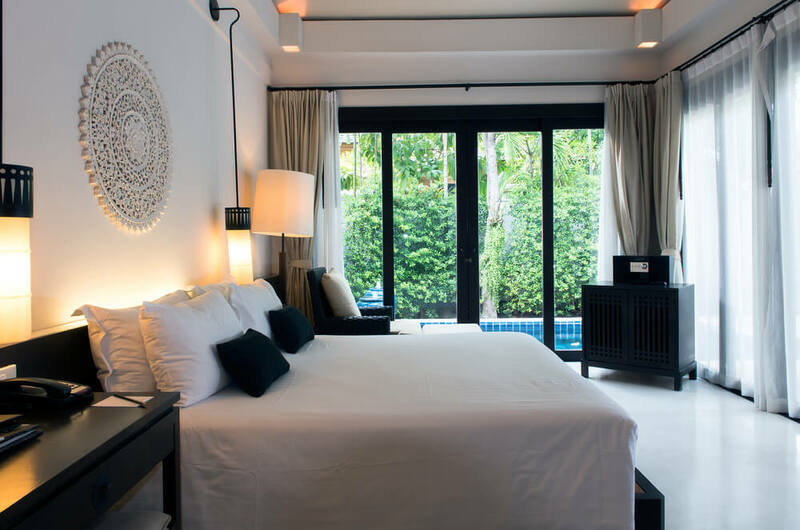 This long and narrow bedroom is spacious enough to provide space for a large, wood framed bed and a small seating area. An area rug placed on top of the carpet helps to establish a foundation for the seating area. This master bedroom features a woven grass headboard that coordinates perfectly with the sage green wall color. Accents of burgundy and light blue add depth and interest to the space. This cheery bedroom features a mix of warm gold tones, crisp white and baby blue. Decorative wall molding provides additional decorative detail and depth of design. This welcoming space features a long, upholstered window seat ideal for relaxing and reading a book. The combination of pistachio green and crisp white linens create a clean, contemporary aesthetic. These master bedroom designs features a large, textured area rug and mirrored night tables. Matching Lucite chairs provide additional seating without taking up visual space. This French country bedroom is filled with lots of luxurious details. The wood flooring set in a herringbone pattern provides a textural foundation for the space. The intricate headboard and fabric canopy provide an impressive focal point for the space. 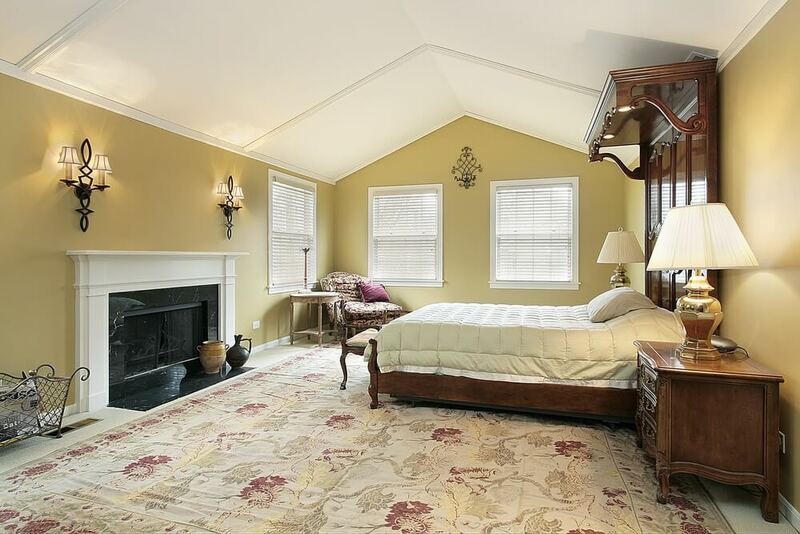 This second floor, master bedroom features golden hardwood floors. A wood framed bed, set under the sloped ceiling, is accented by graphic, green-gray bedding. This Scandinavian-style bedroom is decorated with blond wood furniture set against soft grays and crisp white bedding. The furniture layout of the space makes the most of the rooms unique floor plan. From the headboard, to the bench and vanity, this space is filled with rich detailing. A small alcove provides a space for the head of the bed, as well as matching night tables. A subtle, tufted headboard provides a welcoming place to recline while sitting in bed. A soft color palette of cream, gold and yellow create a calm and inviting atmosphere. This master bedroom is based around natural elements such as the stone flooring and wood ceiling beams. A small stone fireplace provides additional warmth and a beautiful focal point for the room. The color scheme of this bedroom is based on a vibrant palette of blues and greens. A set of white panels provide the ideal contrast against the bright greens walls while also acting as a headboard for the bed. 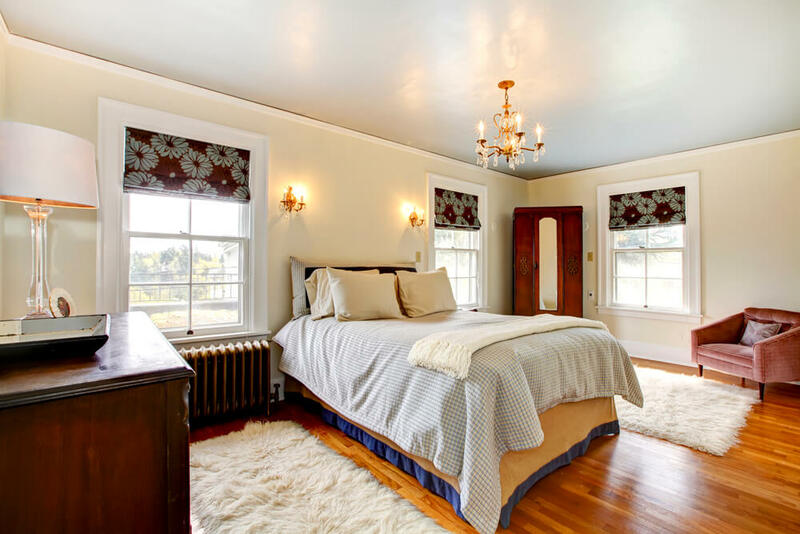 This master bedroom features architectural details such as crown molding and a large row of windows. The space is large enough to accommodate an upholstered platform bed and adjacent seating area. Modern bedroom designs many times feature an upholstered platform bed. A built-in vanity area provides additional storage and a place to get ready each morning. The outdoor view is the focal point of this space. 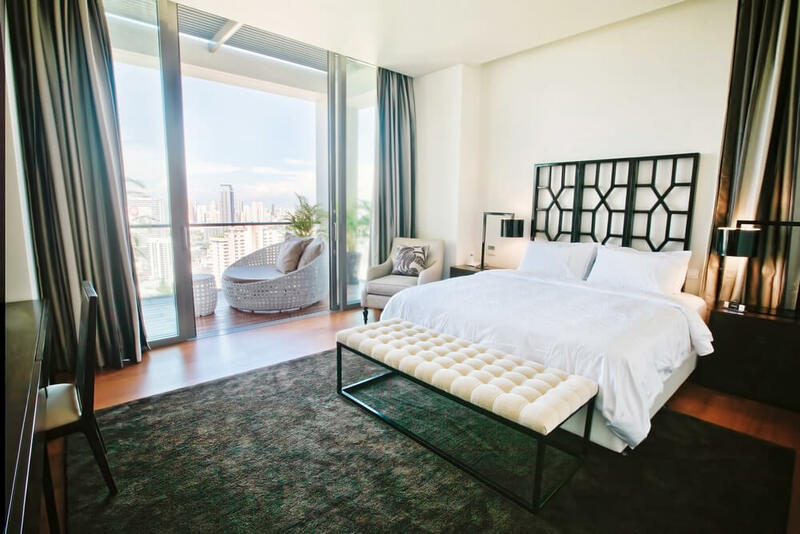 By keeping the room’s decor modern and minimal it allows the view to speak for itself. Featuring original radiators and thick, white trim, this space is designed to display the antique qualities of the space. 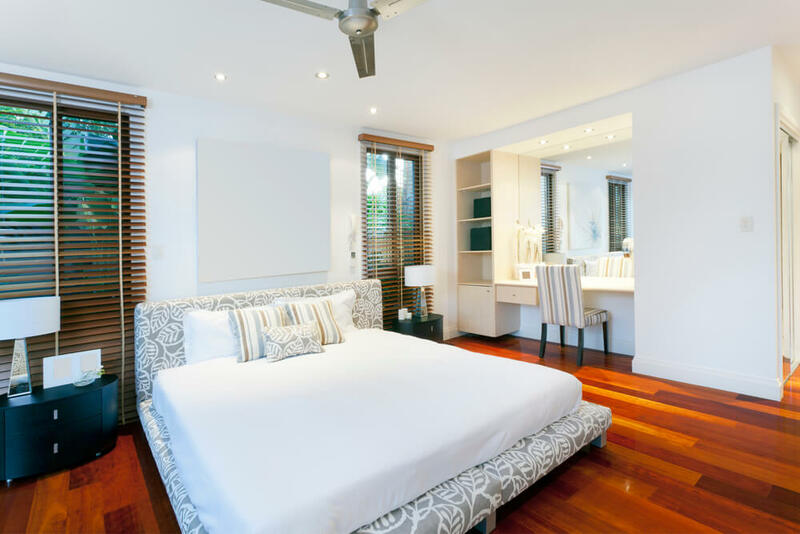 Original hardwood floors provide a beautiful foundation for the room’s design. This traditional space is decorated with green and burgundy accents. The large traditional area rug provides a basis for the room’s color scheme. This spacious bedroom design features a panoramic view of the outdoors. A large, stone fireplace and mantle provide additional architectural detail and warmth to the space. A row of soft drapery provides this master bedroom with privacy as well as softening the hard lines of the wall of windows. An iron and wood bed frame is the focal point for the space. 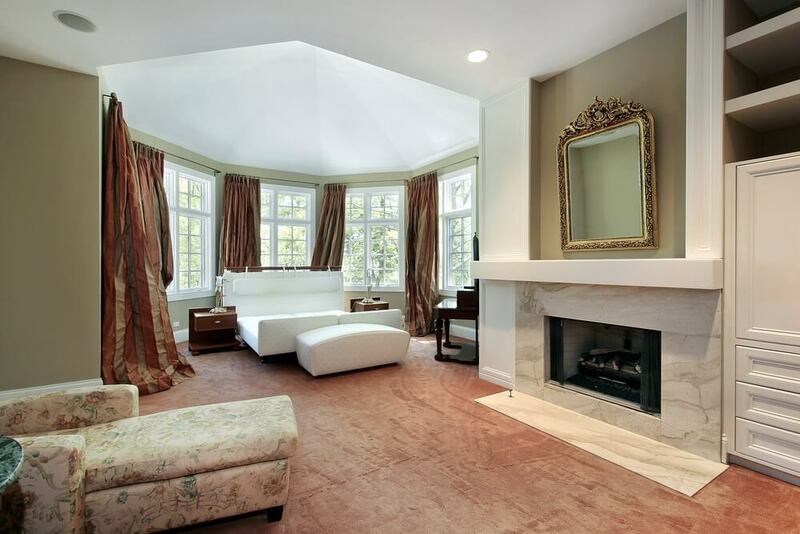 This master bedroom features an impressive fireplace accented by a marble surround and custom wood paneling. The peaked ceiling ceiling makes the space feel even more spacious. 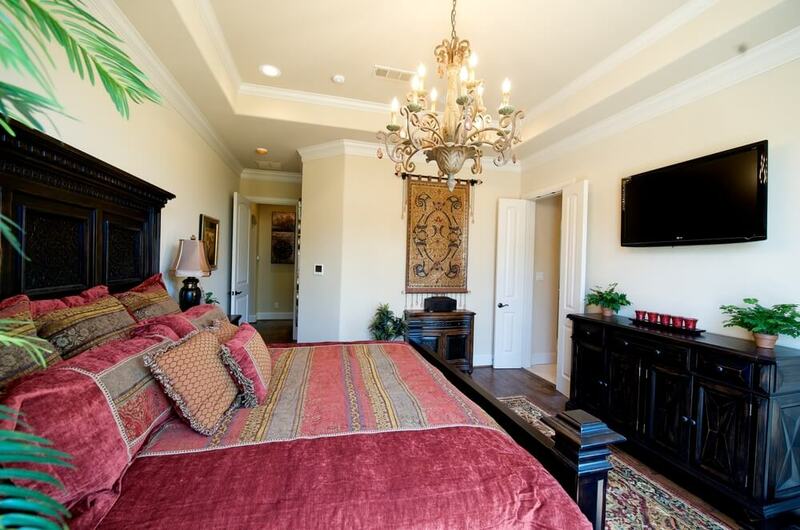 The color scheme for this master suite is based on the traditional area rug. The large windows are framed by rich drapery that coordinates with the bedding. 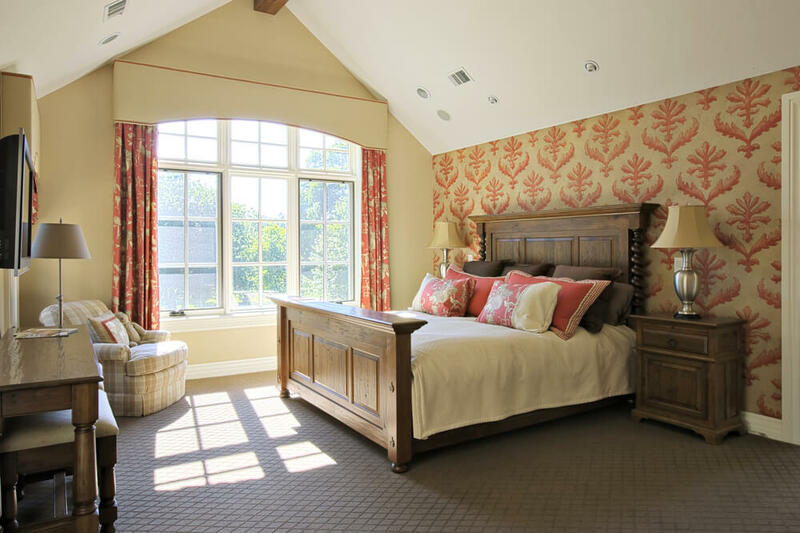 The windows in the large bedroom are accented by vibrant plaid window treatments and white drapery. A substantial rug provides the foundation for the sleeping and seating area. 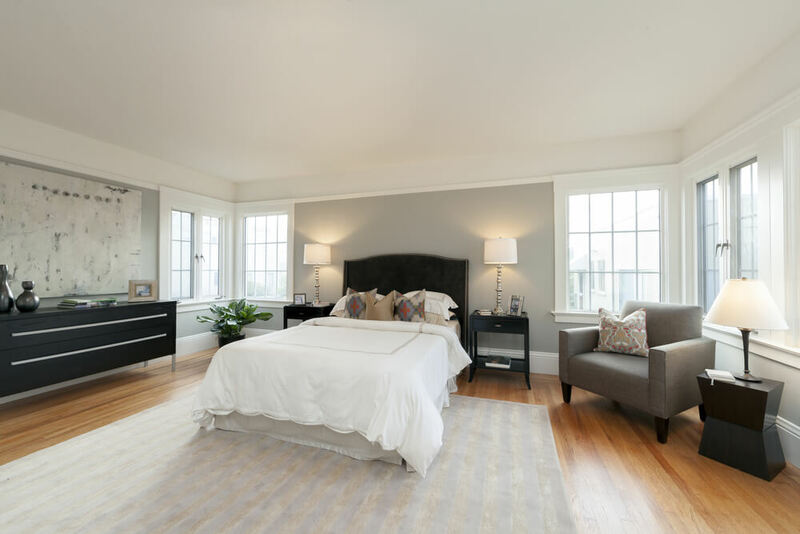 This master bedroom features a tray ceiling accented by recessed lighting. Large patio doors, framed by soft gold drapes, provide easy access to the outdoors. 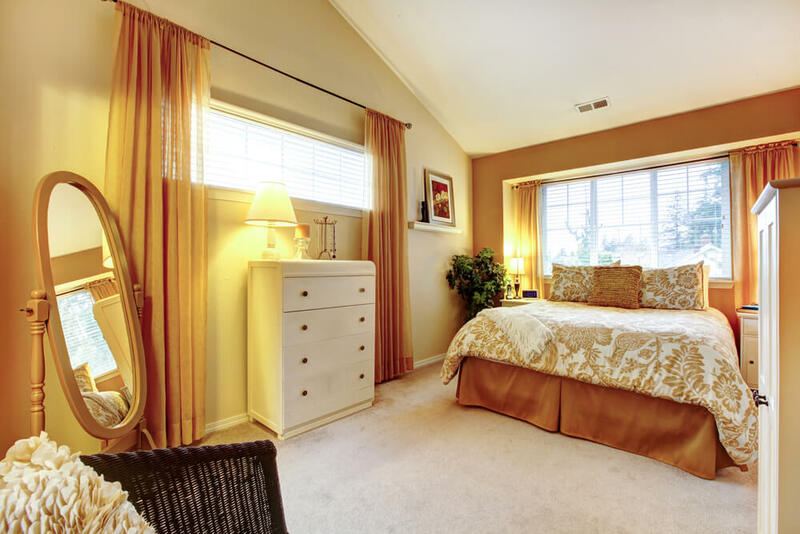 Bedroom designs with warm colors enrich the area. Decorative wood molding provides a frame for the upholstered leather bed frame and headboard. This modern bedroom features a headboard with built-in night stands that create the illusion that they are floating. A row of floor-to-ceiling windows provides a clear view of the pool and palm trees outside.